Why you would always want to return to Nepal? – To me these pictures explain it. And then of course, there are the people.. Ever since the first time I was in Nepal, I’ve been yearning to go back and really do something for the people I met there. It might have been the parents who lived too far away to bring their sick children to a hospital before it was too late, or maybe the mothers who are in constant fear that they will become pregnant, a condition that should be joyous, but instead is all too often lift-threatening in Nepal. Then there were the others, those who were left without treatment, sometimes to die, simply because the hospital was too busy on that day — or because the family couldn’t afford the necessary treatment. They died due to lack of medication, lack of equipment and lack of funds. It all comes down to a lack of access to healthcare. With the small and newly founded association Acces Health Care Nepal (AHCR), we have arranged our first project starting on sunday, the 26th of november 2014. Our team consists of Dr. Justin Jung Malla, Dr. Saujan Shreshta, photographer and MBA Finance Mr. Rajkumal Siwal, nurse Ms. Ashmita Malla, and myself (B.Sc Biomedical Engineering). Together we have created AHCR. Our first mission a health camp in Rukum District. Rukum was one of the sites of Maoist insurgency in Nepal and is today one of the poorest and most neglected areas in the country, where access to health care is either scarce or completely non-existant. You can help us with a donation of your choice at http://gofundme.com/g1mdns. Your help will be greatly appreciated by the people in need of health services in Rukum. With us we bring medication and basic means of treatment. Our doctors will to treat the patients we meet. Equally importantly, we will document the health care situation in Rukum in articles, that will be shared on this blog as a launching point to reach as far as we possible. As biomedical engineer, I will write a technical report about the health care situation in Rukum with suggestions to projects, that may benefit the health care sitution in the area. Below are some pictures from previous health camps I have attended in Nepal. Watching this family of elephants bathing in the mud to cool down is surprisingly funny. We were extremely lucky on this safari. Our guide Hilary was a well educated guy from the Mweka Wildlife College and was so passionate about wildlife, that he didn’t just want to show us the Serengeti, he was there for himself as well – he was just as eager as we were to take photos whenever we saw something exciting. Most importantly, he had no ambition to make extra money by saving gas, he took us as far away as he possibly could. We found these elephants at such a time: far away from everyone we were the only ones. Kicha means crazy in Swahili: Climbing the Kilimanjaro was exhausting and amazing. I had so many pictures from that I have made a page for each day on the Kilimanjaro, however I have made a collection of my favorite photos here. More photos organised by the day can be found through the page “Climbing Kilimanjaro… With mama“. One of the guys told me he gets the chills everytime we listen to it. We agreed that we would listen to it every evening on the rest of the trek. The guys on the pictures include Agapit, Rashiti, Kalisti, Thomas, Calvin, Gofrey, Hilary. Sure enough it’s an intimidating experience: Its in the middle of the night and just few meters away waves of lava are splashing into the mountain side spraying lava up into the horizon in front of us. Located at 160m below see level the Danakil Depression is the lowest, hottest and most hostile place on earth. The vulcanically active areas found in this desert are surreal: they look like something from a different planet. Some friends I have shown these pictures thought they were manipulated. They are not. The Danakil region is inhabited the Afar people and their salt miners go here to chop salt blocks from the flat grounds. Caravans go from Afar Salt Mines to Mekele, the nearest large town, where 5 kg blocks of salt are sold for 22 Ehtiopian Birr, the equivalent of just one American dollar. In September (2014) I went to the Lava Lake at Ert Ale (smokey mountain). The following days we saw a salt lake, a sulphur lake, salt mountains, an oil lake and the salt miners of the Danakil. The lava lake on top of this erupting volcano: wathing a volcano erupt “live”. The salt lake in the Danakil Desert is incredible; on a wide stretch everything is completely white. The sulphur lake looks like something from a different planet. Everything is yellow, green, blue, red. It was 34 degrees celsius at this time but it gets above 50 during the day in the hot season. At this time the whole area is active. A closer view of the suphur crystals. Salt mountains – looks gothic. The Oil Lake was about 60 degrees warm so you could put your hands in it and be surprise: it really is oil and not colored water. The consistency is litterally like oliveoil. I can’t recommend tasting it, it burns quite badly. These salt miners work in 40-50 degrees to chop of 5 kg blocks of salt and sell them for 22 birr (1 dollar) a piece. See more photos on the page for the Danakil Depression. Inventor Reece Stevens developed the #FreePulse patient monitor designed uniquely to meet the challenges at the world's most resource-poor hospitals; early clinical evaluation completed #AHC January 17. Here the first prototype. It is people like Reece that move the world forward - for everyone, rich and poor. Thank you to these incredible people; the new board of #ewh at #dtu - and thanks also to the old board for ~3 great years! #EWH #2016 #Nepal - dinner in #Pokhara after two weeks working in nine of Nepal's most resource-poor hospitals. So proud of this incredible team; thank you for all of your hard work. It truly makes a difference. Also thank you to Sofie, Mathias, Mads, Rasmus and Kristin who were too remotely placed to be here today - hope you get to see #Everest on your trek to Pattale this weekend. Can't wait to see you at conference and here all about it. Kathmandu traffic does get worse than this. Still this video illustrates it pretty well. 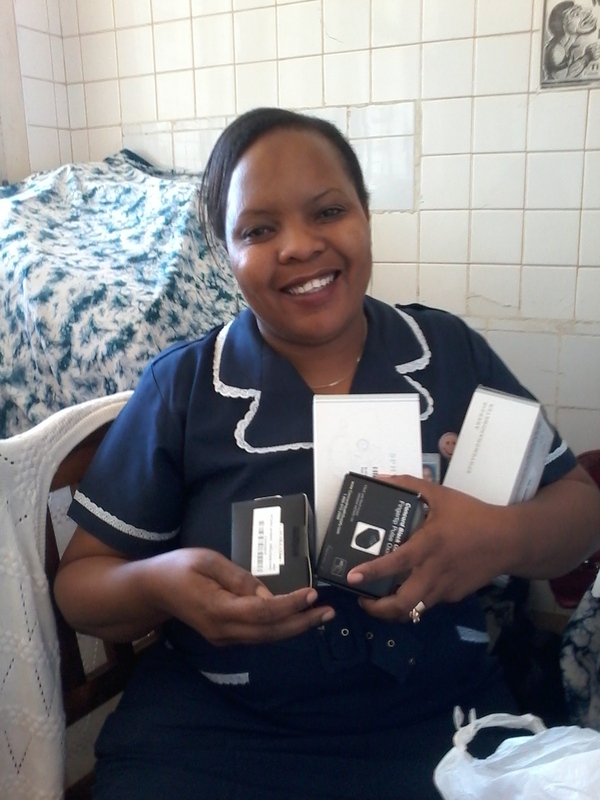 Sister Petrolina, Head of the Paediatric Department at the KCMC with paediatric size blood pressure cuffs and clip-on pulse oximeters. Shortly before we left the KCMC this August, we found out that it was not rare for hospitals to be lacking various equipment in paediatric size. In consequence it would not be possible to measure the oxygen saturation and blood pressure of children. In some cases lack of paediatric size tubes made it impossible to intubate children in need of a ventilator to assist their breathing. Most of these products could probably be made pretty easily with a bit of creativity. This should give ideas for some design projects for most biomedical/design engineers. We had a small budget for our various projects from the EWH and we decided to spend what we had left to buy blood pressure cuffs in paediatric size and clip-on pulse oximeters for the paediatric department at KCMC. "It needs to be done, and not enough folks are doing it."